Aim: The aim of the research was to develop a model that accurately represents an Aramany class I defect and its obturator prostheses fabricated with cobalt–chromium alloy and titanium alloy to compare the deflection and the stress distribution in the rehabilitated area. 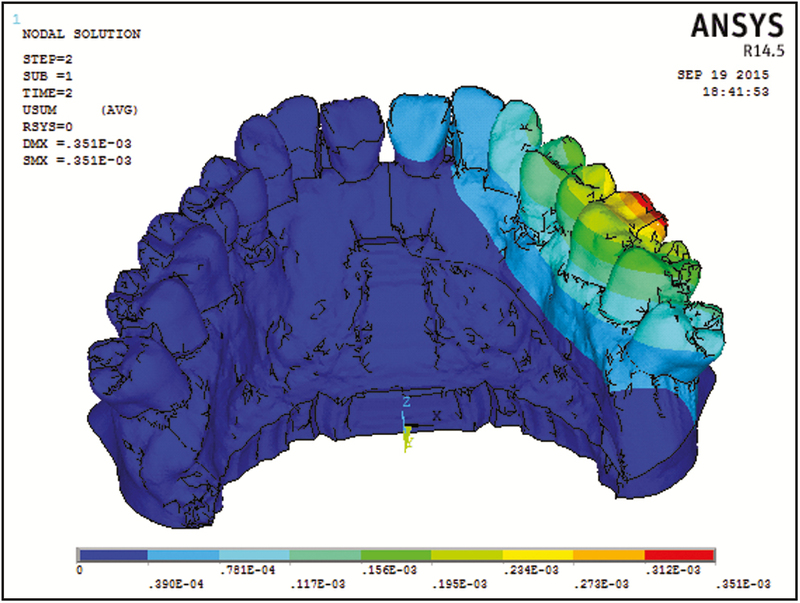 Materials and Methods: Aramany class I defect and the obturator prostheses were generated geometrically using ANSYS 14.5; both were superimposed on each other to mimic the prostheses and the maxilla as one unit. Meshing of models was carried out using hypermesh software and materialistic properties were assigned. The 120 newton load was constituted on the teeth in different directions. Statistical Analysis Used: Statistical analysis of Finite element was not possible. Self-explanatory decoding results in the software were used. Results: The stress distribution and deflection executed by ANSYS provided results that enabled the tracing of Von Mises stress and deflection field in the form of color-coded bands with values in mega pascal. Conclusions: The study shows that Von Mises stresses are higher for the frame work fabricated with cobalt–chromium alloy compared to titanium alloy. The framework made of titanium alloy showed more deflection than cobalt–chromium alloy. Prevalence of oral cancer due to enumerate reasons is rising in the population all over the world. Surgical treatment of oral cancer results in anatomical and functional sequelae that can lead to functional disorders, psychological disorders, and cosmetic issues. Prosthetic intervention can restore the functions leading to improve patient’s quality of life. An obturator prosthesis is frequently vitiated with problems that persist due to lack of retention and stability, leading to traumatic functional occlusion and inability to obtain acceptable oroantral and oronasal seal. Obturator has direct association with the amount of bone lost and the escalating leverage and fulcrum lines constituted in the prostheses with weight an add-on factor. Thus, the analysis of the configuration and size of the maxillary lesion and of the remaining teeth are prime to the successful delivery of the prostheses. It has been observed in literature that Aramany class I defect is the most common type of acquired maxillary defect. This is due to the fact that except for the anterior maxilla, the palate arises from the lateral palatine processes that fuse in the midline; because of this embryologic feature, vascular, lymphatic, and neural elements are divided at the midline. This process explains unilateral palatal and paranasal sinus tumors pathway, which rarely demonstrates contralateral lymphatic spread. The midline creates an effective anatomical barrier for resistance of local tumor extension and also serves as the medical surgical margin in resection of palatal and involved lesions. Hence, one of the most commonly seen acquired defects of the maxilla involves the resection of the dentition, and the alveolar bone along the midline, is Aramany class I defect. The current study was modeled to determine and compare the stress distribution and deflection pattern seen in Aramany class I obturator frameworks fabricated of cobalt–chromium alloy and titanium alloy. The study was categorized as geometrical representation of model, meshing of model, assigning material properties, application of boundary condition, application of different load, analysis of stress pattern, and analysis of deflection patterns. 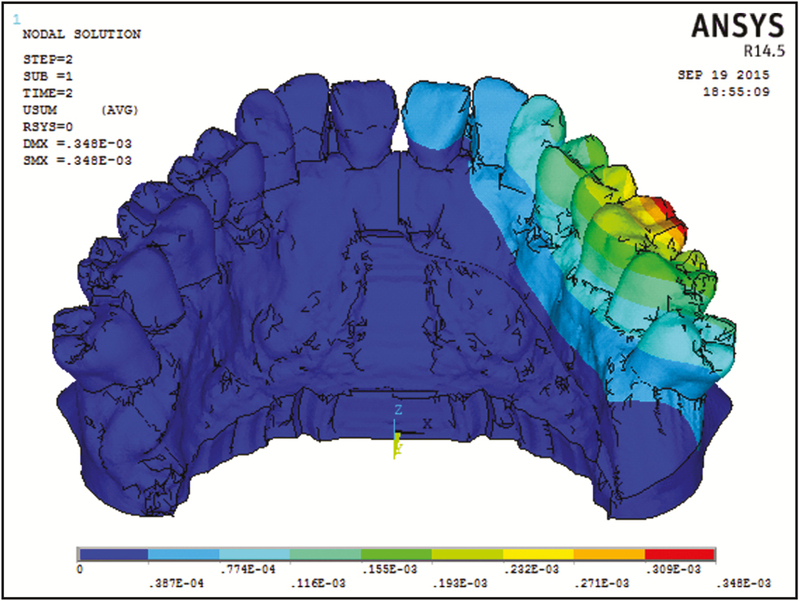 Computerized tomography (CT) scan information of an edentulous maxilla is applied to construct finite element archetypal. The contoured data profiles were converted into x, y, and z axis points and was read by finite element program, which interconnects these axis points forming a line geometry known as wire frame modeling. Joining the lines of each section gave surface geometry known as surface modeling. The final solid geometry of the defect was defined by connecting profile data, and through this procedure, the CT scan information was adapted into three-dimensional solid model of the Aramany’s class I defect. For this study, an obturator model was annually drawn and the removable partial denture frameworks were designed with standardized conditions with complete palate major connector, cingulum rest on the canine, occlusal rests between second premolars and first molar, embrasure clasp between the II premolar and the I molar, retentive arm undercuts at 0.01 inch, and I Bar retainer at the central incisor. The three-dimensional finite element models corresponding to the geometric model were generated using ANSYS 14.5 software. Care was taken during meshing to concentrate elements in the region of greatest interest of stress distribution pattern. SOLID187 by 10-node element was applied in lieu of modeling asymmetrical meshes. The completed anatomical model consisted of total a number of 107,888 nodes and 590,263 elements [Table 1]; [Figure 1]. The corresponding elastic properties such as Young’s modulus (E) and Poisson’s ratio (µ) of the bone, dentition on the non-defect side, cobalt–chromium alloy, titanium alloy, and acrylic resin were determined by literature survey. Properties of the materials used for the model are shown in the table [Table 2]. A supporting system was setup with symmetrical boundary conditions distally having fixed translations. The magnitude and the direction of the loading forces were derived from the studies of Eto et al. and Garechahi et al. The forces applied were 120 newton (N) vertical load applied in occluso-gingival direction on the incisors of the prostheses, [Figure 2] and [Figure 5]. 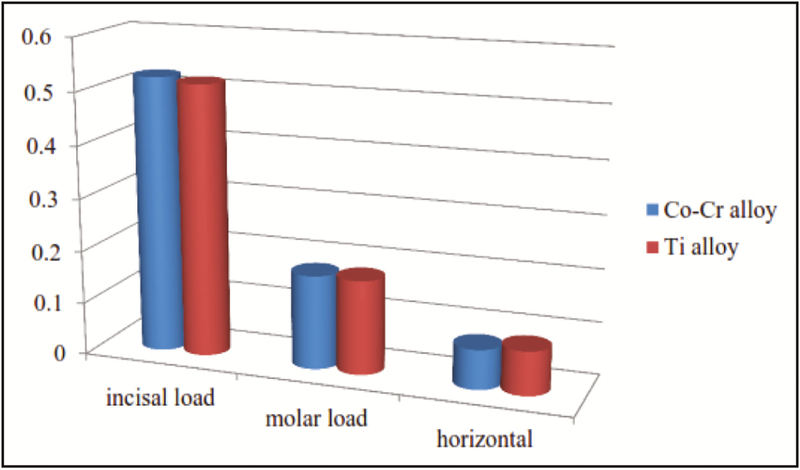 120 N vertical load applied in occluso-gingival direction on the I molar region of the prostheses, [Figure 3] and [Figure 6]. 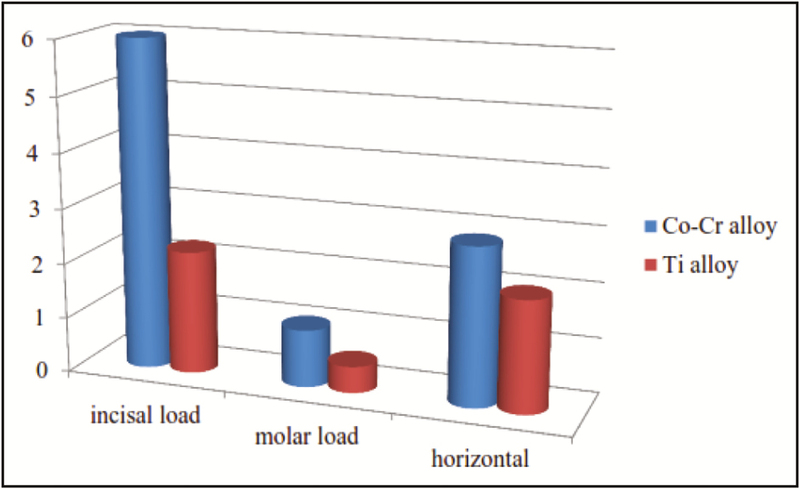 120 N horizontal load applied at 0° on the buccal surfaces of the molar teeth of the prosthesis in the buccolingual direction, [Figure 4] and [Figure 7]. A vertical (120N), horizontal (120N) emulating masticatory forces were applied to model. The model was analyzed for Von Mises stress. The model was studied by the mainframe and displayed by support workstation of finite element software by means of trajectory swerve analyses. The stress analysis executed by ANSYS delivered outcomes that enabled the sketching of Von Mises stress arena in the usage of colored groups. Apiece colored group epitomizes a specific assortment of stress value in mega pascal (Mpa). In this study, a load of 120N in two different directions were applied to the model. It was observed that the highest amount of stress or the maximum stress of 6.00 Mpa was seen in the framework fabricated with cobalt–chromium alloy on application of incisal load of 120N, which is considerably more than the maximum stress of 2.237 Mpa seen with the framework fabricated with the titanium alloy. The minimum stress observed was 0.002 Mpa seen in the framework fabricated with titanium alloy [Table 3]; [Graph 1]. Observation suggested the differences in the stress on the natural teeth of contra lateral side were minimal, & the maximum stress was 0.524MPa on application of incisal load with the cobalt–chromium framework. The minimum stress observed was 0.008 Mpa on application of horizontal load in the bucco-palatal direction with a cobalt–chromium framework [Table 4]; [Graph 2]. It was observed that the highest maximum deflection value of 0.938mm was seen with titanium alloy framework when the load of 120N was applied in the horizontal direction (bucco-palatal) and the minimum deflection value of 0.00168mm was observed with the framework fabricated with cobalt–chromium alloy [Table 5]; [Graph 3]. The degree of complexity in FEA is determined by the number and type of finite elements and the physical and mechanical behavior being considered. Several dental studies using finite element methodology have been considering biological tissues with isotropic properties. The majority of these analyses have treated the materials as having linear elastic properties, in which the structural deformation is directly proportional to the constituted forces. In the studies conducted by Miyashita et al., Gao et al., and Zhao et al., the process of FEA began with the creation of computer aided design model developed from the CT Scans of the selected biological structures; in addition a simplified tooth model without periodontal ligament was used in order to simplify the analysis of the result and the same procedure has been followed in this study. Finite element has been used in removable prosthodontic arena with very limited studies about the obturator prostheses. FEA makes differentiating the material properties of the supporting structures and boundary with load conditions easier. Although the masticatory force varies for each individual and each food, a value previously established in a report that investigated occlusal force in partially edentulous patients with maxillary lesions where the magnitude and the direction of the loading forces were derived from the studies of Eto et al. and Wedel et al. In this study, 120N load was applied and in two different directions, and stress within the frame work and the natural teeth on the contralateral side of the defect were assessed distinctly. It was observed that the maximum stress was seen in the framework fabricated with the cobalt–chromium alloy, which was in accordance with study done by Miyashita et al., and the highest maximum stress was seen when the incisor was subjected to the vertical load. The stress was concentrated on the anterior palatal aspect of the framework of the prostheses around the cervical region of the central incisor, lateral incisor, and the canine area of the likely teeth on the non-defect flank. In comparison, the framework fabricated with titanium alloy showed lower stress values for the same load in the same direction. Overall, in this study the stress values obtained for the cobalt–chromium alloy was considerably higher than that obtained from the titanium alloy framework regardless of the course and the range of the solicitation of the load. 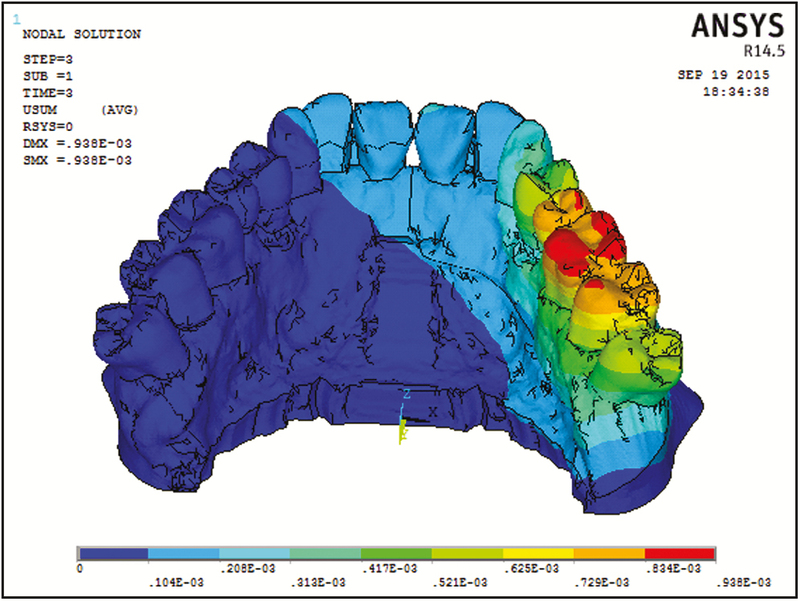 In addition, the stress on the natural dentition on the contralateral side was also seen, and it was observed that although the difference between the stress values obtained for both the frameworks was minimal, the stress value was slightly higher with cobalt–chromium alloy. This can be attributed to the hardness of the cobalt–chromium alloy, which is more than that of the titanium alloy. 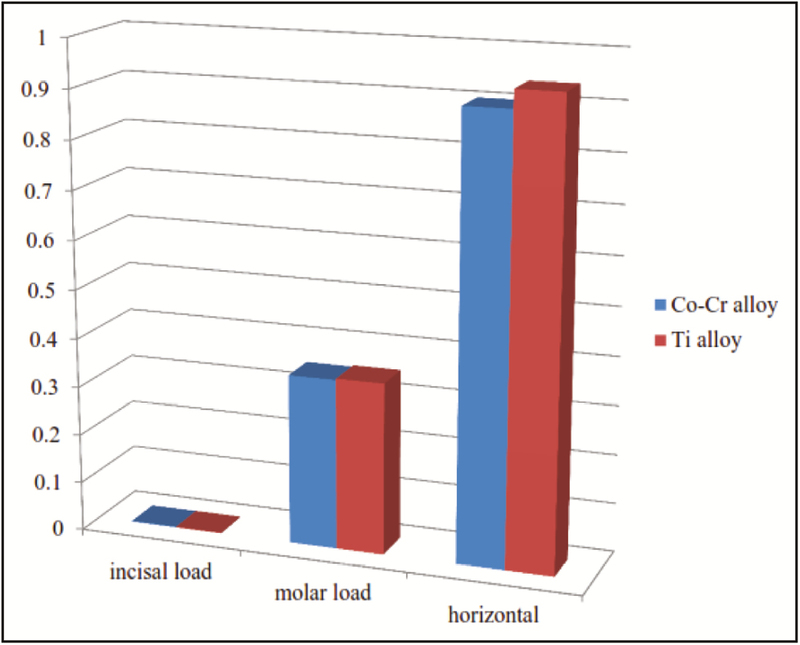 It was observed in this study that irrespective of the direction and area of the applied force, the maximum stress concentration was seen in the central incisor for together cobalt–chromium and titanium alloy. In both cases, when vertical load was applied on the incisor and molar region, the stress was concentrated on the cervical half of the root of the central incisors. On application of horizontal load, the stress was concentrated on the apical half of the root of the central incisors for both the frameworks. In this study, the deflection pattern is interpreted in millimeters. The difference between the deflection seen in the frameworks fabricated with cobalt–chromium alloy and the titanium alloy was seen to be negligible, with the titanium alloy framework showing slightly higher values of deflection that the cobalt–chromium framework. This result may be attributed to the greater flexibility exhibited by the titanium alloy when compared to the cobalt–chromium alloy. The deflection was seen to be in the direction of the applied load. Even though finite element method is a precise and detailed process for exploring assemblies, this study had certain limitations. All the vital tissues in this study were considered to be isotropic instead of anisotropic. The loads that were applied were static load, which is different from the dynamic load encountered during function. In this study, only the stress within the framework and natural teeth was taken into consideration. Consequently, additional studies can be conceded with developments made to the finite element models with the solicitation of lively loading environments. Even though FEA provides a sound theoretical basis of understanding the behavior of a structure in a given environment, it should not be considered alone. Maximum Von Mises stresses existed within the cobalt–chromium framework irrespective of the direction the force was applied. Maximum Von Mises stresses were seen to be highest on the application of the vertical load on the incisors and the stress was concentrated on the anterior aspect of the framework. Similarly, the stress generated by the cobalt–chromium framework on the natural dentition was higher than titanium alloy framework. The deflection values that were interpreted in millimeters were seen to be almost similar in both the frameworks but the titanium alloy framework showed a slightly greater inclusive deflection. Miyashita ER, Mattos BS, Noritomi PY, Navarro H. Finite element analysis of maxillary bone stress caused by Aramany Class IV obturator prostheses. J Prosthet Dent 2012;107:336-42. Parr GR, Tharp GE, Rahn AO. Prosthodontic principles in the framework design of maxillary obturator prostheses. J Prosthet Dent 2005;93:405-11. Quilez MP, Seral B, Perez MA. Biomechanical evaluation of tibial bone adaptation after revision total knee arthroplasty: A comparison of different implant systems. PLoS One2017;12:e0184361. Arinc H. Effects of prosthetic material and framework design on stress distribution in dental implants and peripheral bone: A three-dimensional finite element analysis. Med Sci Monit 2018;24:4279-87. 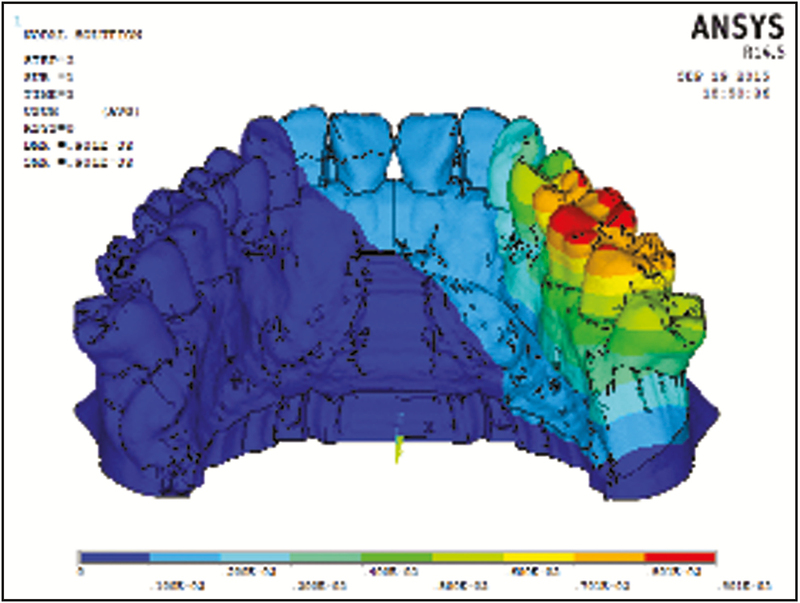 Martin-Fernandez E, Gonzalez-Gonzalez I, deLlanos-Lanchares H, Mauvezin-Quevedo MA, Brizuela-Velasco A, Alvarez-Arenal A. Mandibular flexure and peri-implant bone stress distribution on an implant-supported fixed full-arch mandibular prosthesis: 3D finite element analysis. Biomed Res Int2018;2018:8241313. Inchingolo F, Paracchini L, DE Angelis F, Cielo A, Orefici A, Spitaleri D, et al. Biomechanical behaviour of a jawbone loaded with a prosthetic system supported by monophasic and biphasic implants. Oral Implantol (Rome) 2017;9:65-70. Eto M, Wakabayashi N, Ohyama T. Finite element analysis of deflections in major connectors for maxillary RPDs. Int J Prosthodont2002;15:433-8. Ali MM, Khalifa N, Alhajj MN. Quality of life and problems associated with obturators of patients with maxillectomies. Head Face Med 2018;14:2. 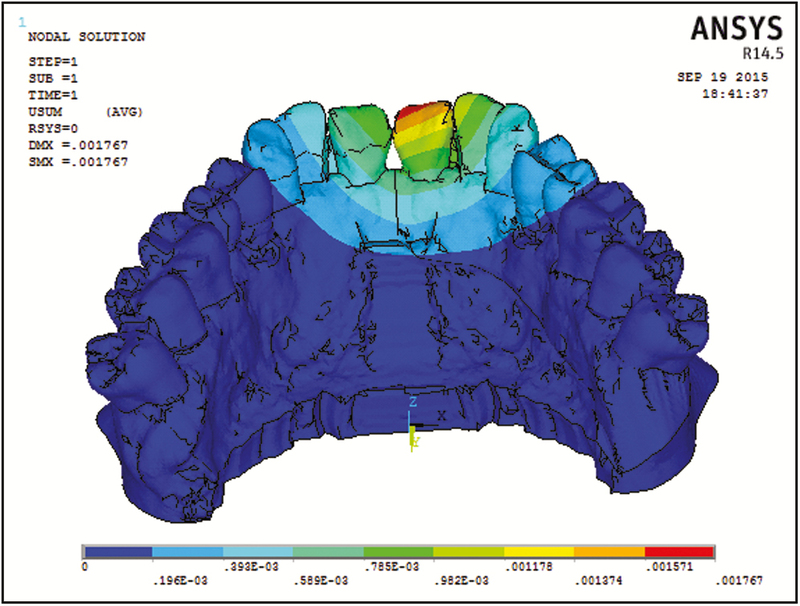 Gharechahi J, Sharifi E, Nosohian S, Aghdaee N. Finite element method analysis of stress distribution to supporting tissues in a class IV Aramany removable partial denture (Part II: bone and mucosal membrane). J Contemp Dent Pract2008;9:49-6. Wedel A, Yontchev E, Carlsson GE, Ow R. Masticatory function in patients with congenital and acquired maxillofacial defects. J Prosthet Dent 1994;72:303-8. 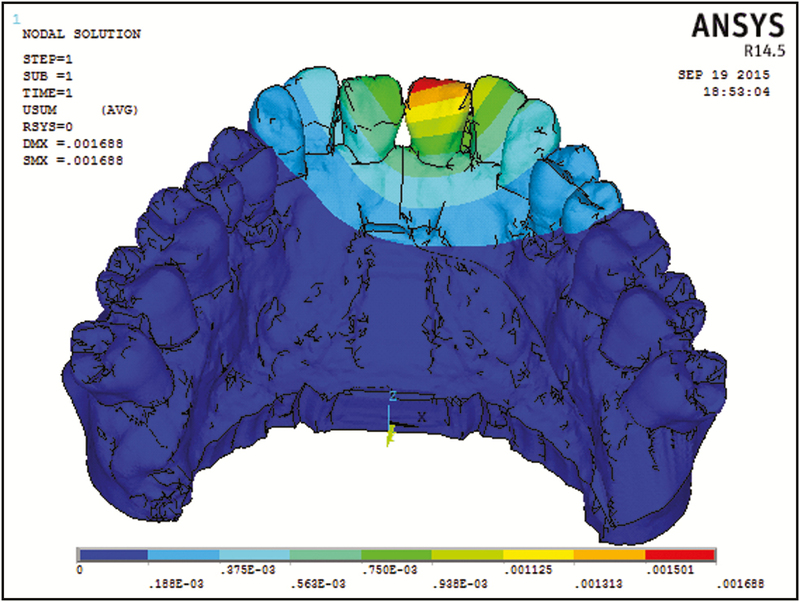 Geramy A, Rokn A, Keshtkar A, Monzavi A, Hashemi HM, Bitaraf T. Comparison of short and standard implants in the posterior mandible: A 3D analysis using finite element method. J Dent (Tehran) 2018;15:130-6. Karanasiou GS, Tachos NS, Sakellarios A, Michalis LK, Conway C, Edelman ER, et al. In silico assessment of the effects of material on stent deployment. Proc IEEE Int Symp Bioinformatics Bioeng2017;2017:462-7. Gao J, Xu W, Ding Z. 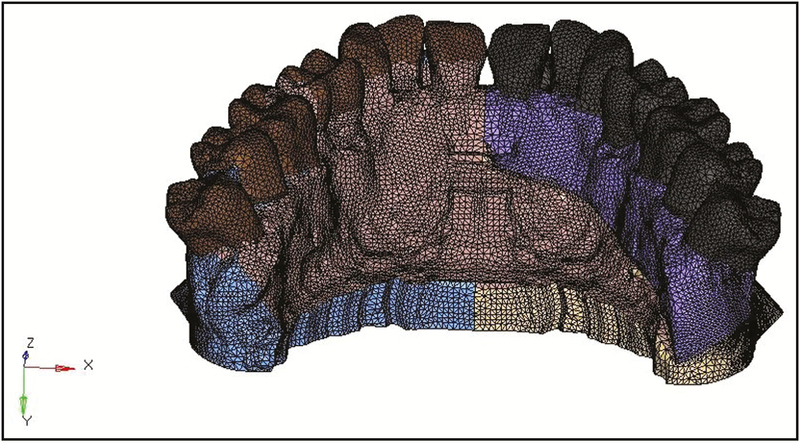 3D finite element mesh generation of complicated tooth model based on CT slices. Comput Methods Programs Biomed2006;82:97-105. Zhao L, Herman JE, Patel PK. The structural implications of a unilateral facial skeletal cleft: A three-dimensional finite element model approach. Cleft Palate Craniofac J2008;45:121-30.